For the Colorado Rockies, tonight starts a hellish 24-day stretch in which they play seven straight winning teams. One of the best of the bunch is in the Mile High City tonight, in the Oakland Athletics. 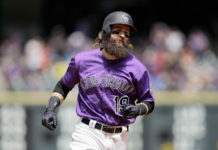 Colorado Rockies (54-47, third place in NL West, 8-2 in their last 10 games) vs. Oakland Athletics (61-43, third place in AL West, 8-2 in their last 10 games). 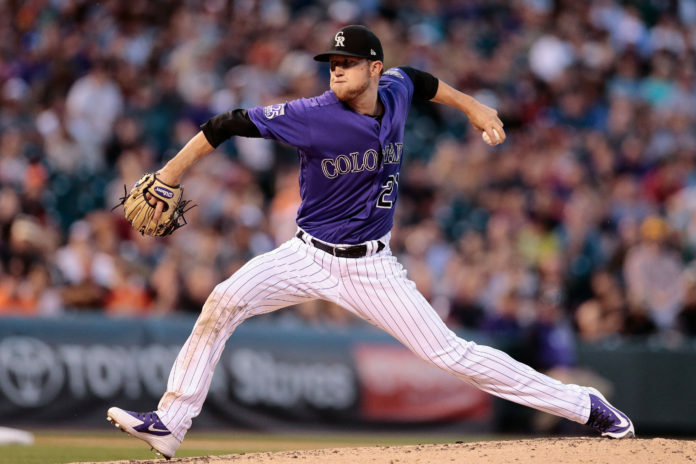 Freeland (5.0 IP, 5 H, 4 ER, 3 K) was left with a no decision in his last start against the Diamondbacks. Freeland’s 3.28 ERA currently leads Rockies’ starting pitching and he is tied for first on the club in wins with eight. Manaea (6.2 IP, 4 H, 2 ER, 5 K) was left with a no-decision in his last start against the Giants. Manaea has been the ace of the A’s staff and he currently leads the team in wins (9), ERA (3.38), and strikeouts (88). That will likely make things difficult for the good guys tonight. Senzatela (5.1 IP, 5 H, 4 ER, 6 K) took the loss in his last start against the Diamondbacks. 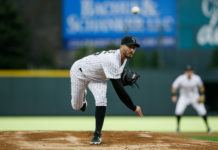 The Valencia, Venezuela native has had a rough go of things for Colorado this year (5.55 ERA) and could be at risk of a demotion once Chad Bettis returns from the disabled list. Anderson (6.0 IP, 6 H, 2 ER, 6 K) earned the win in his last start against the Rangers. 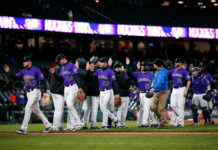 It was only the second time in six starts that Anderson has reached the sixth inning and the former Rockie will return to Coors Field this weekend where he posted a 3.54 ERA in 2014 with the club. Marquez (5.0 IP, 8 H, 5 ER, 6 K) was left with a no decision in his last start against the Diamondbacks. Marquez is currently tied for first on the team in wins with eight and has struck out 14 batters in his last two outings. Montas (5.0 IP, 5 H, 3 ER, 3 K) pitched with a no decision in his last start against the Rangers. Montas has been up and down from Triple-A this year and sports a 3.54 ERA in nine big-league starts. Ian Desmond has heated up lately for the Rockies (14-34 H/AB, 4 RBI, 1 HR) and his batting average now sits at a respectable .241, which at one point was as low as .151. Carlos Gonzalez has proven to be an excellent re-signing from General Manager Jeff Bridich during the offseason (10-34 H/AB, 7 RBI, 2 HR) and currently is enjoying a respectable line of a .277 BA, 12 HR, and 45 RBI. Charlie Blackmon sent the world champion Astros home Wednesday night with a walk-off home run. Blackmon currently holds an eight-game hitting streak and has started to play more like his 2017 self lately (12-36 H/AB, 2 HR, 3 RBI). Khris Davis (10-23 H/AB, 6 HR, 14 RBI) has been a monster lately at the plate for Oakland and has been the catalyst of the Athletics’ offense in 2018. Matt Chapman has played a nice role for Oakland at third base in 2018 and has been hot lately, going 12-28 H/AB, with 2 HR and 5 RBI. Stephen Piscotty is a solid contributor for Oakland, (15-49 H/AB, 3 HR, 7 RBI) and has played well for the A’s in 2018 overall (.265 BA, 14 HR, 50 RBI). Chris Iannetta is just 1-12 H/AB and has had a rough go of things for the Rockies this year, hitting .224 BA, 7 HR, 22 RBI. Pat Valaika (4-20 H/AB, 1 HR, 1 RBI) has struggled for Colorado this year and has not been able to find the same groove that he was in last year (.258 BA, 13 HR, 40 RBI). Raimel Tapia is just batting .222 since being called up to the big leagues this year and with David Dahl getting close to returning from his injury, that may force Tapia back down to the minors. Jonathan Lucroy has been ice-cold for the Athletics (8-57 H/AB) and has been unable to contribute offensively this season (.240 BA, 2 HR, 33 RBI). The former Rockie will be making his first return to Coors Field since being with the club where he hit an outstanding .367 BA in 2017. Dustin Fowler is just 12-66 H/AB at the plate lately and has been unable to find his groove for Oakland in 2018 (.232 BA, 6 HR, 21 RBI). Mark Canha (19-71 H/AB) has struggled recently for the Athletics but is hitting a respectable .257 BA, 13 HR, 40 RBI in 2018.